Cheesy broccoli has been one of my favorite comfort foods since as long as I can remember. I was craving it this cold weekend and made a plant based, no dairy, fancier version. It’s so delicious. I consider it fancier because it contains broccoli's lesser known sister, romanesco. When I find broccoli and/or romanesco plastic free, I can’t help myself! This is a wonderful recipe to introduce you romanesco if you’ve never heard of it or eaten it before. 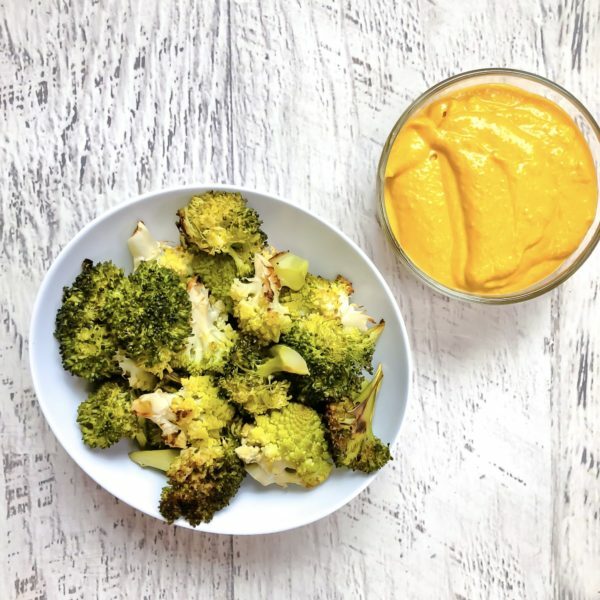 The star ingredients in the cheesy sauce are nutritional yeast, tahini, and butternut squash, which come together to make a creamy, dreamy sauce. These ingredients amp up the protein, vitamin A, B vitamin, and potassium content of this dish. There are two options for preparation. If you like your food to look nice, follow the directions for option 1. Peel (carefully) and chop the butternut squash into small chunks. Steam them until they are soft. Wash and chop the broccoli and romanesco into small florets. Place them on a baking tray with 1/2 tbsp olive oil, salt and pepper. Roast at 375F for about 40 minutes, mixing half way through. Once the butternut squash is soft, make the cheesy sauce. Combine the butternut squash, nutritional yeast, tahini, tamari, apple cider vinegar, and lemon juice into a blender. Blend until smooth and creamy. Add water if needed to blend! Option 1 (prettier version): combine the roasted broccoli/romanesco with the cheese sauce in a casserole dish. Bake at 375F for ~20 minutes until it starts to brown on top. Take a deep breath and enjoy. Option 2 (less pretty version): pour the cheesy sauce over the roasted broccoli/romanesco. Take a deep breath and enjoy!